[169 Pages Report] The data center solutions market is expected to grow from USD 18.56 Billion in 2015 to USD 32.30 Billion by 2020, at an estimated Compound Annual Growth Rate (CAGR) of 11.7% from 2015 to 2020. The exponential growth in the amount of data consumed by various industries, individuals, and organizations has resulted in a swift increase in the demand for data storage. The growing data and storage requirement increases the associated data center assets and costs. To minimize the cost associated with the operations of data centers and to maximize profits, various organizations are developing more scalable and efficient power and cooling data center solutions. In the present scenario, the global data centers are undergoing major technological transformations and are experiencing significant adoption. The global market is segmented into various application types across geographical regions, such as North America, Europe, Asia-Pacific (APAC), Middle East and Africa (MEA), and Latin America. The market has also been segmented into diverse industry verticals, including BFSI, IT and telecom, government and public sector, healthcare, energy, and other verticals. Top-down and bottom-up approaches were used to estimate and validate the size of the global data center solutions market and to estimate the size of various other dependent submarkets in the overall data center solution market. Key players in the market were identified through secondary research and their market shares in respective regions were determined through primary and secondary research. The entire research methodology procedure includes the study of the annual and financial reports of the top market players and extensive interviews for key insights from industry leaders, such as CEOs, VPs, directors, and marketing executives. All percentage shares, splits, and breakdowns were determined by using secondary sources and verified through primary sources. All possible parameters that affect the markets covered in this research study have been accounted for, viewed in extensive detail, verified through primary research, and analyzed to get the final quantitative and qualitative data. This data is consolidated and added with detailed inputs and analysis from MarketsandMarkets and presented in this report. 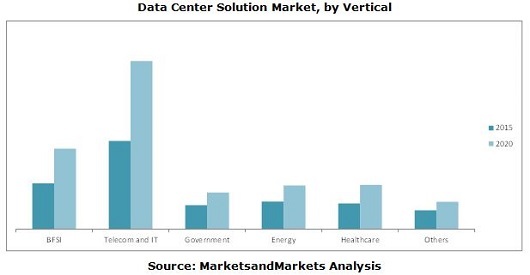 The data center solutions market consists of the following stakeholders: data center solution vendors, support infrastructure equipment providers, component providers, service providers, system integrators, cloud storage providers, colocation providers, suppliers, operators, manufacturers, and end users. A huge number of organizations are expected to adopt their own data center. The market for data center solution is estimated to grow significantly from 2015 to 2020 and also presents a potential opportunity for various data center hardware, infrastructure vendors, and operators in the data center industry. The notable players in this market include Schneider Electric, ABB, Emerson Electric, Rittal, Black Box Corporation, Eaton, Delta Electronics, Tripp Lite, HP, and Siemens AG among various others. The data center solutions market report is broadly segmented into solution, services, user types, verticals and regions. The global data center solutions market is estimated to grow from USD 18.56 Billion in 2015 to USD 32.30 Billion by 2020, at a Compound Annual Growth Rate (CAGR) of 11.7% during the forecast period. Data center physical capacity management plays an important role in attaining data center efficiency through effective power, cooling and space that supports IT loads and operations. The increasing number of data centers with requirement of storage facilities and data center infrastructure is driving the growth of the market. The market for data center construction is proliferating data center solution market. The end users are transforming from traditional practices in data centers and adopting energy efficient power and cooling solutions. The mechanical solutions market is expected to register a significant growth rate in the coming years as cooling solutions drives the performance of the electrical equipment and uptime of the system. Data center cooling solutions present potential opportunities for various vendors and operators in data center industry. The global data center solutions market report quantifies the market for solutions that includes solution in data centers. Electrical solutions include power distribution and measurements, power backup, and cabling infrastructure. The power distribution and measurements market is expected to foresee the highest CAGR during the forecast period. The advancement of technology has introduced intelligent Power distribution Units (iPDUs) and measuring solutions with numerous features, including alarms and diagnostics capabilities that help in managing critical power management. Mechanical solutions include air conditioning, chillers, economizers, cooling tower, server cooling, management system and others. The market is segmented on the basis of user types, such as mid-size data center, enterprise data center, and large data center. The services provided and considered are consulting, system integration, and professional services. Professional services show great opportunities and is projected to grow at a highest CAGR by 2020. The market has also been segmented on the basis of verticals, such as BFSI, Telecom and IT, government, energy, healthcare, and others. The telecom and IT sector is estimated to be valued at the largest market size. The report covers all the major aspects of the data center solutions market and provide an in-depth analysis across the regions of North America, Europe, Asia-Pacific (APAC), Middle East and Africa (MEA), and Latin America. North America is expected to hold the largest market share in 2015, whereas APAC is projected to be at top with highest market share by 2020, due to the developing infrastructure and increasing number of data centers in this region. Telecom and IT is expected to have the largest market share and would dominate the data center solutions market from 2015 to 2020. BFSI and Telecom & IT offers potential growth opportunities, as SMBs and large enterprises are turning towards building new data centers to defend against potential threats, such as advanced persistent threats and other zero-day vulnerabilities. The major vendors providing data center solution and services are ABB, Eaton, Emerson Electric, HP, Rittal, Schneider Electric, Tripp Lite, Delta Electronic, Siemens AG, and Black Box Corporation. 14.10 Hewlett-Packard Development Company, L.P.